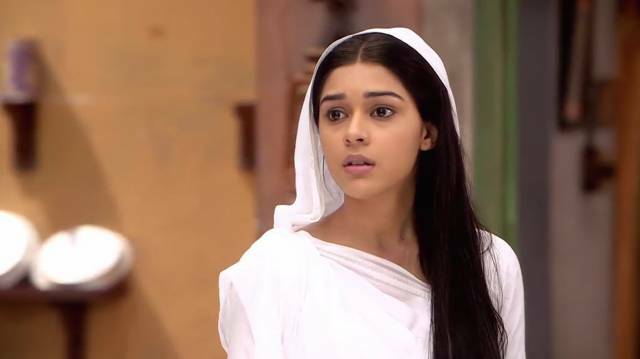 Dhaani told Viplav is a great man and was talking with maturity. Raja stated that she told him to leave his nautanki maa. He said he would not leave and would stay here. Viplav asked if he forgot his beating. He said that he remembered everything and stated that he and his wife could play a game and would see who wins. Viplav laughed and asked if he was mad. He left. Viplav said Dhaani that she was welcomed in the circus, and she asked him to talk, but he knew his reality and would expose him in mahabhoj. Kanak thought to kick Dhaani out on the mahabhoj day. Later Dhaani saw the colored line on the floor and asked Viplav. Viplav told that it was Chanakya neet. Saam… as to suggest and get work done, daan..to give greed, dant…punishment and then bhed… to make him remember past doings. And they tried saam which failed. Next morning Dhaani came and said to Sushma that she would do the work, and she need not do anything. Dashrath asked Shalu to do work. Dhaani lighted the Diyas. Raja and Viplav came. Raja got a call and said he would be back in 10min. Viplav heard and followed his car. Viplav saw him meeting to Kanak, she saw him and called him and asked what he was doing. He told he came to bring things for Mahabhoj. She said that she came to bring new clothes for Raja and told him to buy too. Kanak asked Raja what would he like. Raja said anything. Viplav joked him to buy him a saree. He saw Raja holding salesgirl’s hand and touching her on the pretext of seeing clothes. Viplav thought an idea and called Dhaani. He met with Dhaani and Raj Lakshmi and shared his plan. Dhaani said no. Raj lakshmi said she could do, but she was not a kid. Dhaani agreed. Next articleAmerican Idol 2016 Winner: Check Who Won The Season 15 Title?